Brock Lesnar distracts Seth Rollins with his appearance. This week of WWE Monday Night Raw was live from the Allstate Arena in Rosemont, IL. Universal Champion Brock Lesnar kicked off the show along with his advocate Paul Heyman. Paul Heyman talked about Seth Rollins' claims about Lesnar on last week's Raw. He then talked about Seth Rollins' match against Drew McIntyre tonight on Raw. McIntyre interrupts them and said that after he destroys Rollins later tonight, he will come after the Beast, Brock Lesnar. Seth Rollins then came out with a steel chair and attacked Mclntyre from behind. He then launched a series of continuous blows on McIntyre's back with the chair. Rollins then went inside the ring to attack Lesnar, but Lesnar flew away from the arena. Next, Finn Balor came out to team up with a mystery partner to face the team of Bobby Lashley and Lio Rush. Braun Strowman came out as the mystery partner of Balor. After some amazing action, Braun and Balor beat Lio and Lashley when Strowman landed a Running Powerslam on Rush for the pin. Alexa Bliss came out for another episode of "A moment with Bliss" and welcomed Elias as her guest this week. Elias announced that he will sing a song at WrestleMania this year. They got interrupted by No Way Jose and his Conga Line, which includes Heavy Machinery too. No Way Jose attacked Elias from behind before facing him in a singles match. Elias hit a powerful Drift Away on Jose to get the victory. Kurt Angle came out next to announce his WrestleMania opponent. Angle said he wants to beat Baron Corbin at Wrestlemania 35. He then challenged anyone from backstage to face him tonight. Chad Gable answered the challenge but he lost the match when Angle locked Gable in the Angle Lock. Women's Tag Team Champion Sasha Banks and Bayley came out next to address the WWE Universe. They announced that they will make a special appearance on SmackDown Live tomorrow. Natalya along with Beth Pheonix interrupted them and challenged them for a title match at WrestleMania. Both the teams started arguing before Natalya slapped Sasha Banks. They started brawling before a match was made between Sasha Banks and Natalya. The match ended in a disqualification when Tamina attacked them with the help of the distraction caused by Nia Jax. Next, on Raw, Ricochet came out to face Jinder Mahal in a singles match. After some back and forth action, Ricochet defeated Mahal after hitting him with a 630. Rowdy Ronda Rousey came out next to defend her Raw Women's Championship against Dana Brooke. Rousey defeated Brooke in just a minute after locking her in an armbar. After the match, Ronda attacked the WWE officials before leaving the arena. Next, on Raw, Baron Corbin went one-on-one against Apollo Crews. After some action, Apollo Crews beats Corbin via a Roll-up. After the match, Kurt Angle came out to congratulate Apollo Crews for the victory. Batista then showed up on the screen for an interview with Cole. He said that his hatred towards The Game started way before Evolution. He then blamed Triple H for not giving him the opportunity and vowed to end Triple H's career at WrestleMania. In the main event of this week's Raw, Drew McIntyre came out and talked about last week's action. He then challenged Roman Reigns for a match at WrestleMania. Seth Rollins interrupted and face him in a singles match. After some extraordinary action, Brock Lesnar came out to distract Seth Rollins. Seth Rollins got distracted as Mclntyre hits a Claymore Kicks on Rollins for the win. WWE: okay who do you want Angle to face in his last match? That’s all I got is that enough? Fans: so who is it? 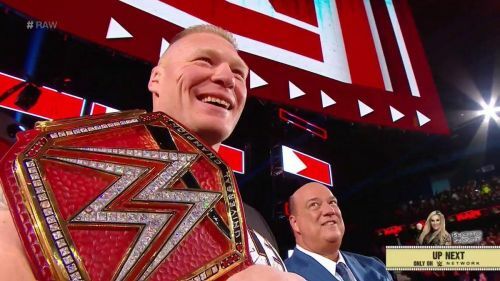 Fans react to WWE Monday Night Raw (4th March 2019).